Tonight we celebrate Erev Sukkot, the beginning of a week-long festival of thanksgiving and remembrance of our agricultural and nomadic roots. For a schedule of events for today and tomorrow, see our previous post, Super Sukkot Sunday. Sukkot is drawn directly from our sacred texts, where it is mentioned as “the festival of the seventh month,” the Feast of Ingathering, and the Feast of the God. The role that Sukkot plays as a fall harvest festival is also evident in the words of our tradition; Exodus tells us to gather the labors from fields at the end of the year. In addition, the structures that we dwell in also are intended to remind us of the dwelling places of our ancestors during the journey from slavery to freedom; in Leviticus, Moses commands the people to live in sukkot (literally booths) for seven days to remind all future generations of the journey. Our observance of Sukkot completes the fall High Holy Day season. We begin each year with Rosh Hashanah, and then Yom Kippur 10 days later. Five days after we complete our fast, Sukkot begins. In ancient times, Israelites observed the holiday by bringing crops from their fall harvest to the Temple. Today many congregations symbolically complete these rituals by decorating our pulpits with fall fruits. In addition, with the spirit of offerings in mind, foods are often donated to local food banks or shelters. Indeed, for us as Reform Jews, Sukkot stands as a call to social action, and in particular, to feed the hungry. And we at Congregation Adas Emuno are proud to say that our congregants have been especially generous in providing food donations for our local food pantry. The week-long festival opens with a holy day, on which many attend special worship services that feature a traditional liturgy and special prayers for the holiday. Throughout the week, it is customary to spend time in the sukkah, usually for meals. Jewish law prescribes the building standards for the structure: It must have at least three walls made of any substance, while the fourth may remain open. The roof of the sukkah can provide shade, but it must remain open to the sky and stars; usually s’chach—leaves, branches, and plants that have grown from the ground—is used for the incomplete covering. 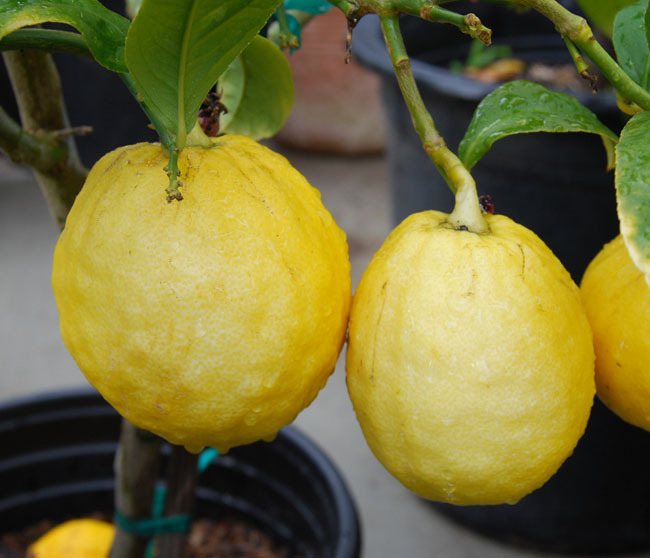 Inside the sukkah, we bring together the Four Species mentioned in Leviticus and the Talmud to help us fulfill the various mitzvot of the holiday. The lulav, containing the palm, myrtle, and willow, and the etrog are shaken in six directions to indicate God’s presence in all of creation. In addition, we also are encouraged to welcome ushpizin, or exalted guests, into our sukkah. Traditionally these guests are the spirits of Abraham, Isaac, Jacob, Moses, Aaron, Joseph, and David. The integration of women into Jewish tradition has given us a list of women to include as well: Sarah, Rebecca, Rachel, Leah, Miriam, Deborah, Esther, and Ruth. Welcoming guests into our sukkah, just as we welcome them to the Passover seder, has come to represent a modern interpretation of this traditional practice. Sukkot is a time to contemplate our relationship to our tradition, to nature and ecology, to those in need, to divine providence, and to the sacred dimension of all life. And for this festival season we at Congregation Adas Emuno join together in wishing you a Chag Sameach! It is not everyday that I take as my rabbinic teaching text, not the Torah or the Talmud… but Sports Illustrated! I love basketball, playing (once upon a time) and watching. I went to Duke University, and am a passionate Blue Devils fan. I grew up a Knicks fan in the glory days of Willis Reed, Dave Debusschere, Walt Frazier, Bill Bradley, and Earl-the-Pearl Monroe. This year I rooted for King James to get his crown and the Dream Team to get their gold. Some years ago when I lived in the Philadelphia area the Sixers' Allen Iverson went off for a career high 60 points against the Orlando Magic. The very next week, Sports Illustrated did a piece called: “How It Feels… To Be On Fire.” It was marvelous. And I said to myself: There’s a Yom Kippur sermon there! Isn’t it interesting that the mystics in Judaism use the phrase “catching fire” just as modern athletes do. Athletes describe being “in the zone,” when one loses track of time and space. Mystics describe being “in the zone,” usually during ecstatic prayer, when they too lose track of time and space. Athletes see nothing but net. Mystics see nothing but God. In such moments all obstacles to perceiving God everywhere are consumed…. It is a rare and precious moment… Usually it comes and goes almost in a flash. But no matter: the real impact of hitlahavut is in the memory of such moments. They are stored in the contemplative’s mind and become important steps on the road toward the much cooler but longer lasting goal of [devekut], an attachment to God in which one may live and act. Okay, so why am I talking about basketball and kabbalah? Why am I comparing the runner’s high to the religious high? As a ballplayer and as a rabbi , yes, I have “caught fire” on the court and on the bimah (in my better days), but what am I really getting at here? It is my belief that the hitlahavut, the religious fervor, of Hasidic Judaism, is a sorely missing ingredient in the life of the American synagogue. This sermon is about rekindling our religious flame. It is about finding our Jewish passion, our Jewish enthusiasm. Enthusiasm, by the way, from the Greek, en (in) and theos (god). What sparks each soul is going to be different for every human being. But in the words of the old church saying: “Find your glory.” Find what you are passionate about. Show your enthusiasm. Both my sons interviewed for new jobs this year. I told them that when I have hired someone, more than the resume, more than the references, it ultimately came down to the passion the candidate showed for the position. In the Jewish context our tradition teaches that one should be passionate about three things: learning, praying and giving. These three things are called “the foundations of the world”. They are considered the classic pathways to loving God and loving your fellow. On this Yom Kippur I want to take up the challenge of religious passion. And yes, in this secular age, this skeptical age, this is a challenge. And yes, unbridled passion can sometimes degenerate into fanaticism, but don’t let the zealots and the fundamentalists hijack passion. It’s too precious, too important. Learning (Torah). Can we be passionate about Jewish life-long study? Can we infuse our Jewish learning with as much zeal as our secular pursuits? Can we take the plunge and dive into the sea of wisdom that has been deepened for three and half millenia? Ha-ha stories amuse and entertain.Ah-ha stories expand and teach.Ahhh! Stories connect and inspire. What’s on your reading list? I’d be happy to make suggestions. Come learn with us every Shabbat morning. This year we are studying the master work of Moses Maimonides, considered the greatest sage in Jewish history. Make the connection. Experience the ah-ha and the ahhs! Praying (avodah). Can we be passionate about prayer? Ironically, for many of us, this may be the most difficult of the three paths, even though it is the easiest. Orthodoxy excepted, we are not much of a praying people anymore. When it was revealed that up to the day he died, Pope John Paul spent several hours a day in prayer, some of it raptuous, we were piqued but largely uncomprehending. When we sense the spirit of many of our Christian neighbors we are perhaps momentarily tantalized but then inhibited. Jewish ecstatic prayer is largely a lost art, though its roots are Biblical and its branches bear fruit in every age and place. Come pray with us. Nourish the spirit. Discover a lost art. Giving (g’milut hasadim). Can we be passionate about our sharing? Of our wealth? Of our time? Of our hearts? “Live generously.” And we thank you for supporting our congregation! Isn’t it interesting that when Moses found his calling, when his life changed forever, the imagery is fire. And, yes, I can rememberHow the thunder was my heartAnd the fire was my soul. O God, I do remember.The fire burns in me anew.And here I am, once more. The last of my story: after I was accepted to rabbinical school, my mother sent me a cassette tape in the mail, with no indication of what it contained, but simply a note attached that said, “put in your tape deck and push play”. It was the voice of my grandfather, and the tape from my Bar Mitzvah- a message I probably didn’t even hear when I was 13, but at least didn’t remember. Maybe I wasn’t supposed to hear it then. Who knows? But 14 years later, and some 12 years after his death, I not only heard but felt the blessing he offered me. That is my wish for us, on this Yom Kippur. May we discover that holy purpose, that holy flame. Could it be that the eternal light above us burns brightly for that very reason, to remind us to find the flame within? For a fraction of a second in December, a dying remnant of an exploded star let out a burst of light that outshone the Milky Way’s other half trillion stars combined, astronomers announced Friday. Ironically, you and I didn’t notice because most of the light was in the form of gamma rays that are blocked by our atmosphere. But instruments on every NASA spacecraft went berserk. Even though a lone physicist, from Ben Gurion University in Israel no less, had predicted that what they call a magnetar flare of such huge proportions could theoretically occur, scientists were dumbfounded. [It] seems so improbable it’s a puzzle right now, said NASA’s lead scientist. “There’s something going on here that we don’t understand. I’m no astrophysicist, but I’ll tell you what’s going on. That star is on fire. It’s got hitlahavut, baby. It wants to go out with a bang. But I hope that star realized that it shone its whole life. The divine light is everywhere. Just find your glory. He turns. He shoots. Nothing but net. Nothing but God. 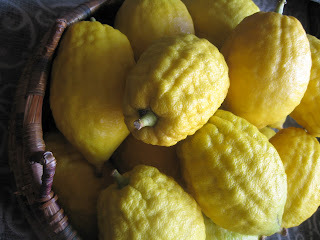 L’shanah tovah. May you be inscribed for a good year, a passionate year, on fire! 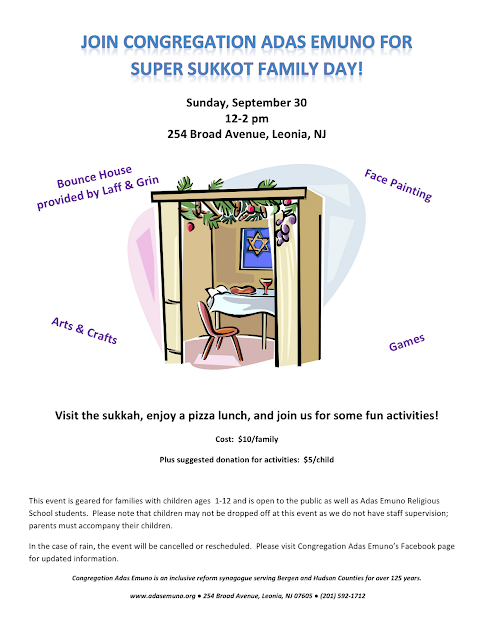 This Sunday, September 30, the Jewish Holiday Season continues with several events in celebration of the Festival of Sukkot at Congregation Adas Emuno, Bergen County's cool shul. 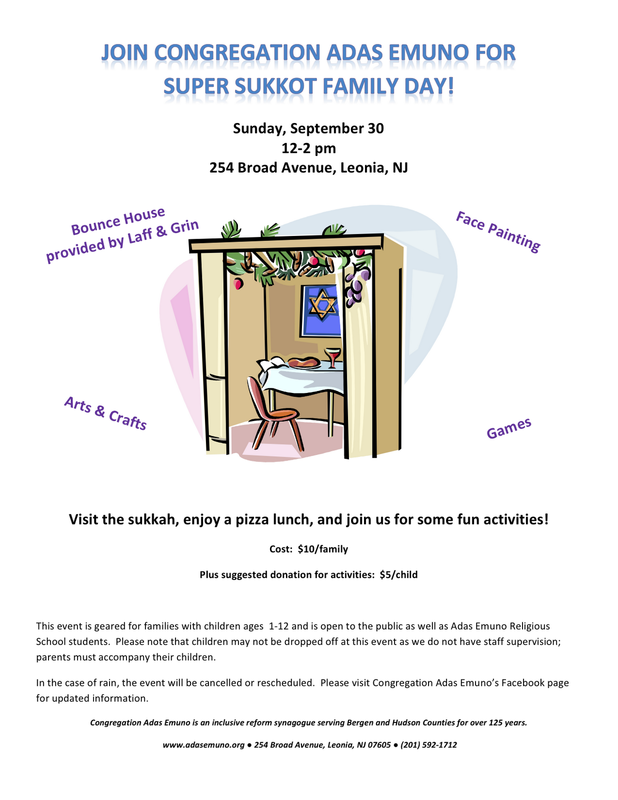 For children (of all ages), immediately following the conclusion of Sunday's Religious School session at noon, please join us for Super Sukkot Family Day on Sunday, from 12 to 2 p.m. Eat lunch with us in the sukkah and enjoy some fun games and activities! There will be pizza, a bounce house, face painting, and more! This event is geared for families with children age 1-12 and is open to the public as well as Congregation Adas Emuno Religious School students. The price is $10/family plus a suggested donation of $5/child for activities. Please note that children may not be dropped off at this event as we do not have staff supervision; parents must accompany their children. In the case of rain, the event will be rescheduled or cancelled. Please visit Congregation Adas Emuno's Facebook page for updated information. At 5 PM, join us for a Sukkot Pot Luck Dinner in the Social Hall. Please bring a (non-dairy) appetizer, main dish, side dish, or dessert. Please call Eileen Cohen to rsvp for the dinner: 201-944-3382. $15 suggested donation per family, $5 for singles. At 6:30 PM, join us for our Sukkot Service beginning in the sanctuary, and concluding in our brand new sukkah. And on Monday, October 1, 10:30 AM, Rabbi Barry Schwartz and Student Cantor Alison Lopatin will participate in the Sukkot Festival Morning Collaborative Service at Temple Sinai in Tenafly..
Come join us as we continue to celebrate the Jewish new year, and this ancient harvest festival of thanksgiving. And as we give thanks for all that we have, let us also remember those in need, and continue to collect food for our local food pantry. Here is a last look back at the year 5772, the photograph having been taken the day before Erev Rosh Hashanah, and appearing in the issue of Leonia Life on the Friday following the Jewish New Year. And in the spirit of blowing our own horn, several congregants commented at the break fast, following the final shofar blast that signaled the end of Yom Kippur yesterday evening, that this was the best High Holy Days services ever (or at least in recent memory) at Congregation Adas Emuno! In case there was any doubt before, I think we all learned that our little Bergen County based temple is the cool shul. Now, let's make 5773 the best year ever (or at least in recent memory) for Adas Emuno! And now for a moment that made motion picture history, the climactic scene from the 1927 film The Jazz Singer, the first talkie (although it was a something of a hybrid, as some portions were in the older, silent film format). The story was an autobiographical portait of Al Jolson, who plays himself in the film, and was, in his time, the most popular performer on the planet, the equivalent of folks like Bing Crosby, Frank Sinatra, Barbara Streisand, The Beatles, Elvis Presley, Michael Jackson, Madonna, and who would it be today, Lady Gaga? This scene portrays the High Holy Day theme of Teshuvah, repentance as a turning back to God, a returning. Jolson turned his back on the family tradition of serving as Cantor to the Jewish community in order to become a jazz singer. But with his father on his deathbed and unable to perform the Kol Nidrei prayer, Jolson returns to take his father's place in the synagogue, performing the prayer in proper jazz singer style. The German composer Max Bruch is well known for his Kol Nidrei composition, based on the melody of the prayer sung on the eve of Yom Kippur It is one of the few classical works to feature the cello. Bruch himself was not Jewish, and just as performers like Perry Como and Johnny Mathis have recorded versions of the prayer as a popular song, following Jolson's lead, so too have many great musicians from every conceivable background performed the instrumental version. What follows is a recording featuring Pablo Casals from 1936, with the London Symphony Orchestra, conducted by Landon Ronald. So, let the music and the spirit linger a little longer, as we say, one more time, Shana Tova! As we get ready for Kol Nidrei tonight, here is some music to get you back into the High Holy Day spirit. First, courtesy of Be'chol Lashon, we have a Sephardic piyut or hymn recited at the start of Erev Rosh Hashanah, entitled Ahot Ketana. The lyrics are in Ladino, the Spanish-dialect that is the Sephardic equivalent of Yiddish (Yiddish being the language of Ashkenazi Jews), and the singer and songwriter is Consuelo Luz, who is Chilean-Cuban. According to the write-up, she "explores her Sephardic roots adapting ancient Jewish prayers and ballads from Spain, the Mediterranean and the Middle East into new 'World Music' style songs in a passionate marriage of Jewish and Latin soul." For something a little more traditional, the Amonai Shamati is described as a "beautiful, pleading Sephardic High Holy Day piyut recited on Rosh Hashanah and Yom Kippur before the Amidah." This "traditional Moroccan melody is sung by Eyal Bitton." And now for something completely different, there is Jew Man Group doing their "kosher" remix of Lady Gaga's "Born This Way" with Star Wars-style titles and Star Trek imagery. Entitled "Kol Nidrei" appropriately enough, you may have to watch it over on YouTube by clicking on the link they provide, due to copyright issues and depending on where you're watching from, but if you do, we'll still be here when you're done. Now that was a lot of fun, wasn't it? And a great message, to boot! And with that, we at Congregation Adas Emuno wish you an easy fast, and may you be sealed in the Book of Life for a good year for 5773! Look for our next post tomorrow evening, with music to break the fast by! What better way to observe the Jewish New Year than with Israeli robots? It's no secret that the State of Israel is a leader in technological innovation. So let's all say, Shana Tova, Mr. Robota! May 5,773 be a wonderful year for all of the Jewish people throughout the world! A year of peace, security and advancement! This Institute was founded by the parents of the three IDF soldiers, in memory of their sons, Benny Avraham, Adi Avitan, and Omer Souad, kidnapped and murdered by Hezbollah in 2000, in the battle for the northern border in October 2000. The soldiers' bodies were returned to their homeland more than three years later, in January 2004. The Institute was inaugurated in June 2008, and is currently engaged in developing patrol autonomous robotic systems for guarding, identifying and handling suspicious objects and events as well as in developing autonomous robotic systems for mapping and delivery. Background music: Shana Tova; Lyrics by Levin Kipnis, Music by Nahum Vardi. The Sons' Hora Folkdance was produced by the R&D Institute for Intelligent Robotic Systems, at the Department of Computer Science, College of Management Academic Studies, in memory of Benny, Adi and Omar, who, in sacrificing their lives, have made us determined to make every effort to overcome the enemy and especially, to prevent the circumstances that led to their murder from happening again. GVANIM GROUP, Ilana Segev, Gilad Weiss and Eli Ronen. Geeks are boring? NO way. Nobel Laureates live in ivory towers? University presidents are inaccessible? Perhaps you should ask Technion President Prof. Peretz Lavie for some Hip Hop lessons. Join the entire Technion family and the world community of lovers of education, science and technology with some of the hottest robots from Technion - Israel Institute of Technology as they strut their stuff to a hip-hop cover of the traditional Jewish song, Shana Tova, or happy new year for the Jewish New Year 5773. Save it and share it with children and loved ones everywhere as a special new year's greeting! In case you were wondering where the word robot came from, it was introduced by the Czech writer and playwright Karel Čapek in a 1920 play entitled Rossum's Universal Robots. The word robot comes from the Czech work for labor, and the play told the story of artificially created workers rising up against their human masters. A righteous gentile who vehemently opposed Nazi Germany, the Gestapo declared him Public Enemy Number Two in Czechoslovakia, before he died of pneumonia in 1938. His brother Josef, a painter, died in the Bergen-Belsen concentration camp. The first film image of a robot appeared in 1927 in the German film, Metropolis. The director, Fritz Lang, was raised Catholic, but his mother was a convert from Judaism, and while Hitler loved Metropolis so much that he wanted Lang to take charge of the German film industry, Lang wisely chose to flee instead, making his way from Paris to Hollywood, where he made movies for every major film studio for over two decades. With this, Asimov established an ethical basis for the science of robotics that is taken seriously by computer scientists working on artificial intelligence programming. Be that as it may, there is nothing robotic about our celebration of Rosh Hashanah and Yom Kippur at Congregation Adas Emuno, or our wish to you for a happy and healthy 5773! For those of you early-risers busy getting your youngsters off to religious school, and for all those young at heart, here is a musical Rosh Hashanah greeting, Muppets-style! Even if you never heard or seen anything of Hannah Montana, we all can certainly appreciate the sentiment, and share in the wishes for a Happy New Year, a Shana Tova! And to courageously embrace this year, 5773, just born. But painfully aware that so many of our fellow citizens languish in economic hardship. Too many of them remain unemployed, underemployed, and uninsured. Too many do not share in the promise of this country and see the American dream slipping further and further away. Remind us, O God, that we can do better and should do better. Remind us that our wealth and that our status, all that we have is but Your gift, and that we are called upon to share it, for we are all Your children. As we soon gather to elect a president for these United States, guide our citizens to enlightened decision-making, and our leaders to inspired vision. We are grateful for the vibrancy of our democracy and the celebration of our diversity. Yet again we beseech those who govern to lay aside personal gain and partisan politics to engage in the unfinished work of justice in our society. At this New Year we cannot help but remember our soldiers in harm’s way, still fighting and dying in America’s longest war…And we pray for their safety and speedy return. At this New Year we cannot help but think about our brothers and sisters in the land of Israel, who also stand in harm’s way, and are daily threatened by a genocidal regime, sworn to “wipe the Zionist entity off the map,” and now on the brink of acquiring nuclear weapons of mass destruction. We pray for peace and the surest way to pursue it. At this New Year we cannot help but think of the teeming refugees of civil war, and of natural disaster, in the near and far corners of the planet, known and unknown, remembered and forgotten. We pray for peace and healing and the surest way to pursue it. May we find common purpose to do Your will, to rise to our greatest potential, to reflect our creation in Your image… And to walk with You forward to peace and purpose. As we approach Rosh Hashanah and Yom Kippur I want to wish everyone in the Jewish community a happy and healthy new year. The High Holy Days are a time for humility and reflection. They are a time for families to gather and embrace our many blessings and they offer a chance to think about how we can improve our lives in years ahead. The High Holy days highlight the role that faith plays in guiding our lives. They inspire us to become better people. I recently had the privilege of returning to Jerusalem for a few days, and during that trip I was reminded once again what a remarkable country has emerged in 64 short years. Israel is a vibrant healthy democracy where entrepreneurship is encouraged, the economy is thriving and innovation infuses nearly every aspect of society. Israel is among America's best friends and closest allies in the world and I believe no one should never doubt this basic truth: A free and strong America will always stand with a free and strong Israel. Here at home Jews have also contributed greatly to the tapestry of our nation, public service and in the private sector. The Jewish community has helped build our economy, helped defend our freedoms, and helped earn our special place in history. We're grateful for that immense contribution, and we look forward to an even brighter future. It's Ann and my sincere wish that you have a sweet New Year. And with that, we can only express our gratitude to live in a nation where the two major candidates for the highest office in the land, and the most powerful position in the world, would take time out from their busy schedules to offer us their thoughts and warm expressions of friendship and fellowship on our High Holy Days. Grant us peace. Your most precious gift, O Eternal Source of peace, and give us the will to proclaim its message to all the peoples of the earth. Bless our country, that it may always be a stronghold of peace, and its advocate among the nations. May contentment reign within its borders, health and happiness within its homes. Strengthen the bonds of friendship among the inhabitants of all lands. And may the love of Your name hallow every home and every heart. Blessed is the Eternal God, the source of Peace. Amen, Shana Tova to Barack and Mitt, may the best candidate win, and to everyone else, don't forget to vote in this election year 5773! I had been driving for forty years when I fell asleep at the wheel and had the accident. My car was legally parked as it backed into the other vehicle. I am forwarding my marriage certificate and three children, one of which is a mistake as you can see. You have changed my little boy to a girl. Will this make any difference? I cannot get sick pay. I have six children. Can you tell me why? I am very much annoyed to find that you branded my son illiterate. This is a dirty lie as I was married a week before he was born. Unless I get my husband's money pretty soon I will be forced to live an immortal life. Moses led the Hebrews to the Red Sea, where they made unleavened bread which is bread without any ingredients. Moses died before he ever reached Canada. Solomon, one of David's sons, had 300 wives and 700 porcupines. Jews and Christians should have only one wife: this is called monotony. Yes, communication can be perilous, and humorous, even at the same time! Communication shares the same root as community. Communis in Latin, is itself derived from munis, which means gift, or service. Thus remunerate means to give back, and immunity originally means one who is exempt from giving. The suffix co- means shared. In its most basic sense, then, community is the place where we share our gifts and communication is the means by which we achieve it. Think about that. To communicate is to ultimately share one's gifts. And the collective sharing of our gifts, our goals, our hopes, our fears—that is community. The ongoing challenge of building true community, here at Adas Emuno—that is what I want to talk about at this New Year. What does it mean to share of the self, to transcend the self? It means believing that the blessings that come my way, will be all the more resplendent in the company of others. It means believing that the burdens that come my way will be all the more eased in the company of others. It means believing that the effort of giving will be rewarded by the privilege of receiving. An anonymous but very wise person once said that "shared joy is doubled; shared sorrow is halved." Your family, and by extension your congregation, your family of families, if it is truly community, should be a place where your joy is magnified, and your sorrow is diminished. Think about the joy of building together, learning together, praying together, singing together, marching together, mourning together, celebrating together, cooking together, gardening together. A dozen years ago now Harvard political scientist Robert Putnam published an article on this subject, and it created something of a sensation. The piece was called "Bowling Alone". Putnam's proposition was that Americans were dropping out of civic life. Still bowling, but bowling alone, and not in leagues. Many Americans continue to claim that they are members of various organizations, but most Americans no longer spend much time in community organizations—we've stopped doing committee work, stopped serving as officers and stopped going to meetings. I came across another trend while reading Putnam, which piqued my interest. It had to do with informal gathering, which is also crucial to community. In the late 70's the average American entertained friends at home about 14 times a year. Now it is 8. That is a 35% decline! People are spending significantly less time in each other's homes, never mind in their houses of worship, and community halls. The yearning to seek out like-minded people and lift our voices in celebration and lamentation. The yearning to rediscover our roots and educate ourselves and our children. The yearning to join hands to build a better world. For nearly a century and a half little Adas Emuno has been this kind of community. That’s why we’re still here. That’s why we matter. In Hebrew we call it kehillah k'doshah. The Holy Community. Community that touches the soul. In the old days, many congregations had a double hebrew letter, koof, koof, before their name. The initials stood for kehillah k'doshah. Adas Emuno may not have had these initials in its name, maybe because our founders were German Jews rather than eastern European, but it could have. But they chose a name a community minded name just the same. Adas is another term for community, meaning gathering. 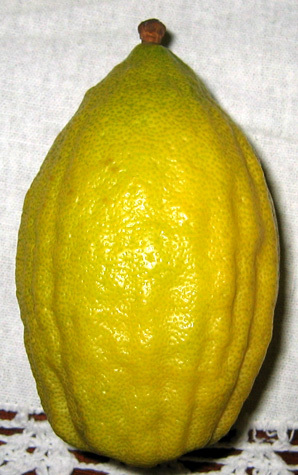 Emuno is a variant of the word for faith. Our name means, the community of the faithful. And in truth, that should be the measuring stick, the litmus test, we set before us. In our words and in our deeds are we a holy community; a faithful community. 1. How do we perpetuate our warmth and intimacy in the age of social media? 2. How do we reach out and recruit new members of our congregation to affirm our diversity? 3. How do we engage in strategic planning to insure that our long history has a new chapter in the face of demographic challenges? 4. How to we honor the spirit of renewal in our worship, education, and activism? 5. How do we excite a new generation of volunteers and donors? 6. How do we better listen to each other? 7. And ultimately, how do we facilitate the sharing of our gifts for the benefit of all? Friends, I am under no illusion that the task will be easy. Just one look at the center of Leonia shows that this town is struggling. The Jewish community in this past of the county is declining. Last summer, having newly arrived, I presided over a bittersweet ceremony that dedicated these ark doors from one congregation that closed, and our holocaust scroll, from another that is no more. But this congregation is like an old tree that sprouts new shoots. Just look at us on Sunday mornings, on Hannukah eve; on Purim. Congregation Adas Emuno is an extraordinary, altogether unique, and beautiful spiritual community, a place where we join hands in praying for healing and in service for those in need, where hearts and minds work together in hamishe cooperation to create something for ourselves, something that is greater than ourselves. That my friends, is community. And community is precious. Debby and I are deeply privileged to be part of this community and hope to be so for many years to come. A hasidic master once asked his disiciples how they could tell when the night had ended and the day had begun. "Could it be," asked one of the students, "when you can see an animal in the distance and tell whether it is a sheep or a dog?" Another asked, "Is it when you look at a tree in the distance and can tell whether it is a fig tree or a peach tree?' ''No,'' answered the rabbi. "Then what is it?" the disciples demanded. "It is when you can look at the face of another and see that it is your brother. Because if you cannot see your brother, it is still night." At Adas Emuno we see each other. A new day has dawned. So too, a New Year. Shanah tovah! Every morning I arise at dawn, hop on my bicycle, and ride down to Overpeck Park. As I hit Fort Lee Road, I pass the giant utility poles that are home to the parrots of Leonia. They squawk their greeting, and I tip my helmut hello. On my right I pass the Leonia section of Overpeck. The 6:00 AM walkers are already doing their loops, just as the sky is alighting. I cross over to the larger Ridgefield section of Overpeck, and begin my own triple loop, each about 2.5 miles long. As I round the first bend, the tip of the Manhattan skyline comes into view. It never fails to surprise me. I pass the ball fields and there on the horizon is the Empire State Building, and further down, the new World Trade Center. The sun is just coming up, and often it shines on the side of those skyscrapers, casting them in striking hues. Turning again, I ride along the river, the dawn sky reflected in a palate of pinks and oranges over the water as the sun rises. The water is placid, the sky is brilliant; the birds wing their way over the water. Sometimes a sculler glides along, causing barely a ripple. All is well with the world… except it isn’t. The Leonia section of Overpeck Park, as many of you know, contains a memorial to those lost in 9-11. The Ridgefield section of Overpeck Park once revelaled a glimpse of the twin towers that are no more. Every morning that I take my idealic bike ride the subtle but persistent reminder of our national tragedy is there. The reminder that our beautiful world is also a troubled world is there. This week we are celebrating the Jewish New Year. That’s why we’re here. But this past week also marked the 11th anniversary of 9-11. The commemeration this year was so much more muted than last year, for the tenth anniversary. That is understandable. and my worry over a nuclear Iran. Permit me to explain why each affects me deeply, and the lessons they impart, as we gather in prayer and reflection at this new year. A meeting connected to my work at the Jewish Publication Society brought me to a building next door to ground zero. I had not visited ground zero before, so I arrived early to visit the site. It was a weekday morning, but already hundreds of people were lined up. I heard languages from around the world. As you make your way to the entrance you see photographs of people gathering in the wake of 9-11, and holding vigils on every continent. Ground zero is not a quiet place these days. It is a booming construction site. But once you enter the Memorial Park, the surrounding noise seems to fade away. You come to the edge of the memorial pools, water cascading along the sides. First I am struck by the enormity of their size. These pools represent the exact footprints of the twin towers. They are huge, and 30 feet deep. The void that absence creates is so palpable. Then you come to the edge and you begin to see the names of the deceased. You begin walking around the edge of the square. Row after row of names. I begin to read one, then tens, then scores. There are hundreds of names; hundreds of hundreds. There are too many names to possibly read. But seeing each individual name you begin to realize the enormity of the loss. Every name a precious soul. Every name a whole universe. Every name beloved by someone who grieves to this day. The water streams on; as life goes on. But the falling water is also, I think, our tears. They never run dry. In the front center of the grove stands one tree taller than the rest. It looks healthy and vibrant, but support cables are by its side and there are scars on the trunk. 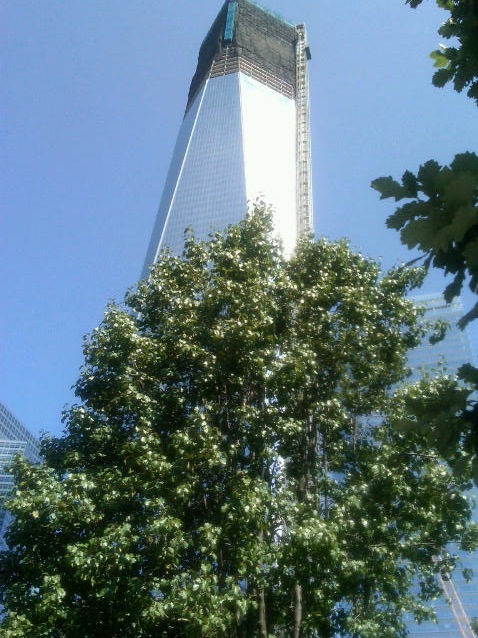 This is the Survivor Tree: the calloway pear tree found as the only living thing at ground zero. Rescuers, looking in vain for signs of human life, found none. But then they found this scorched eight foot stump, and thought it too was dead, until they saw the roots were still intact. Carefully they removed the charred tree and brought it to the Parks Department Plant Nursery in the Bronx. For nine years the tree was nursed back to life, almost succumbing a second time during a particularly bad storm. Two seasons ago it was brought back to ground zero. Last year President Obama laid a wreath at its base. The Survivor Tree is now 30 feet tall. This year it blossomed, on the first day of spring, astounding New Yorkers. I have a picture of the survivor tree that I took on my cell phone. I will pass it around. Behind it is the new World Trade Tower. The new tower is some 93 stories tall, and due to be completed in 2013. From the ashes, life. The irrepressible life force of a tree. The irrepressible life spirit of a nation. We Jews can relate to that. We know what it is to face tragedy, and to overcome tragedy by affirming life in its wake. What was it about Judaism that led Jews, in circumstances that should rationally have led to despair, not merely to survive, but to respond with a new burst of creativity? For that, historically, is what happened. The division of the kingdom after Solomon led to the flowering of prophecy. The destruction of the First Temple and the Babylonian exile reinvigorated the study of Torah. Responding to the destruction of the Second Temple , the sages created the vast rabbinic literature: Mishnah, Midrash and the two Talmuds. The encounter with… Christianity gave impetus to Jewish bible commentary; with Islam, to Jewish philosophy. The crusades led to new forms of north European Jewish pietism. The Spanish expulsion evoked the mysticism of Safed. The Holocaust, in human terms the worst tragedy of all, led to the single greatest affirmation of the collective Jewish will to survive: the birth of the State of Israel. Our common scripture and our common history cherish life; venerates life. Amidst the cleared away rubble ground zero is coming to life again. The museum that will tell the story is not open yet, but if you want to glimpse some of that story, if you want to sense the inexhaustible life affirming potential of everyday people, then stop in at St. Paul’s Church just a block away. The story of their ministry in the wake of 9-11 is inspirational. People of all faiths joined hands, night and day, to comfort the afflicted and assist the rescuers. Three months after 9-11, the church helped sponsor the lighting of a Hannukah Menorah at ground zero. Light against the dark. Which brings me to my second reason for speaking on the eve of this new year. Our beautiful world is still a deeply troubled world. Thomas Friedman wrote that our greatest failure prior to 9-11 was a failure of imagination. Our failure to imagine how committed to evil some people can be. Our failure to imagine how such people will employ any means to justify their ends. Our failure to imagine that there are religious fanatics who cherish not life, but death. Today I am haunted by my perception that we are still failing that test of imagination. We just don’t want to believe that there are people who hate us. The Islamic republic of Iran has said, repeatedly, that America is the Great Satan and Israel the Little Satan. Its president, the head of state, has said, repeatedly, that he wants to wipe Israel off the map. Its top cleric has said, repeatedly, that Israel is a cancer to be eradicated. We don’t want to believe it because we are not hateful, spiteful people. We don’t want to believe it because our religious traditions abhor the very notion of suicide bombers and the slaughter of innocents. We don’t want to believe it because we forget history very quickly. Well, even as the Jews rise from the ashes time and again, we are haunted by history. We are told to remember, remember, never to forget. So we remember that, in the lifetime of many of us here today, people of good will did not, could not believe what a man named Hitler could do. How much history do we need to forget in order to delude ourselves once again? 1. The Soviet quarrel with America was ideological. Iran’s quarrel with Israel is existential. The Soviets never proclaimed a desire to annihilate the American people. For Iran, the very existence of a Jewish state on Muslim land is a crime. an abomination. 3. Irans’s clerical regime rules in the name of a fundamentalism for whom the hereafter offers the ultimate rewards. The classic formulation comes from Tehran’s fellow Jiahdist Al-Qaeda: “You love life and we love death.” Try deterrring that. We just can’t wrap our heads around that . “You love life; we love death.” We don’t want to believe it because it runs counter to everything we have been taught. To our deepest values. To our most cherished principles. I know this is grim stuff, but with the window of opportunity rapidly closing, can we begin the new year by avoiding the most dangerous situation in the world? Never mind the existential threat to Israel? We pray that our leaders, here and in Israel, will be determined, wise and courageous as they wrestle with the weighty decisions that must be made, and will be made. Allow me to close on an optimistic note. Al-Qaeda and Teheran are right about one thing. We do love life. We love life, as that pear tree that would not die loves life. As the victims loved life. As the rescuers loved life. As the rebuilders love life. As our Jewish heritage loves life. As our nation loves life. Life will find a way. It always does. We will write ourselves into the Book of Life, because that is who we are. On this Rosh Hashanah we say, as we do each and every time we raise a glass: L’Hayim! To life! An Installation and a Welcome!